About 40 years ago (July 1978), Louise Joy Brown was born at Oldham General Hospital in England, weighing 5 pounds, 12 ounces. This birth may sound like any ordinary baby story, but the conception and delivery of Louise, the first human conceived through in vitro fertilization (IVF), symbolized the possibility of having children for women who suffered from infertility. IVF, a type of assisted reproductive technology (ART), is an intricate series of procedures widely used to aid women who suffer from infertility or genetic problems with conception. The process involves collecting and retrieving mature eggs from the woman’s ovaries after stimulating ovulation using hormones; combining the suitable eggs with sperm in a petri dish to allow fertilization to occur outside the body; and transferring the fertilized egg to the same or another woman’s uterus. Typically, extra embryos can be frozen and stored for future use, although not all embryos will endure the freezing and thawing process. Both observational studies and small, randomized clinical trials have shown higher pregnancy rates and better perinatal outcomes with frozen-embryo transfer contrasted with fresh-embryo transfer in women who do not ovulate. However, in women who do ovulate but still suffer from infertility, it is not known if frozen-embryo transfer, as compared with fresh-embryo transfer, has any effect on the rates of live birth. This study was an open label trial, where both the patient and physician knew if they were receiving a frozen or fresh embryo. Due to the nature of this clinical trial, the gold standard “double blind” was not possible, potentially resulting in study bias. The authors found that the rate of live birth in ovulatory women who responded to ovarian stimulation did not change between frozen-embryo transfer (48.7 percent) and fresh-embryo transfer (50.2 percent). As for the secondary outcomes listed above, no significant differences were found between the groups. The only adverse event observed at a higher frequency in the fresh-embryo transfer group was the rate of ovarian hyperstimulation syndrome — a medical condition where women overstimulate their ovaries with egg growth hormones. This syndrome typically ranges in severity, and it may occur when there is too much hormone medication from IVF treatment in your system capable of stimulating the development of eggs in the ovaries, leading to swollen ovaries and abdominal pain. Other symptoms may include rapid weight gain, vomiting, respiratory distress, diarrhea and blood clots in the legs. According to the Centers for Disease Control and Prevention (CDC), the United States has over 440 clinics that offer ART to patients struggling with infertility. However, there is unfortunately no information on long-term outcomes of ART. For example, it is not known whether the infants born through IVF develop unforeseen health complications. For this reason, in 2016 the CDC improved the National ART Surveillance System 2.0 (NASS 2.0). Using NASS 2.0, fertility clinics can now report their ART cycles to the CDC so they can monitor and study maternal and infant health outcomes related to ART. As IVF research and monitoring programs further mature, one might think about the results of this study: either frozen or fresh embryo transfers seem to be suitable for ovulatory women to give birth. 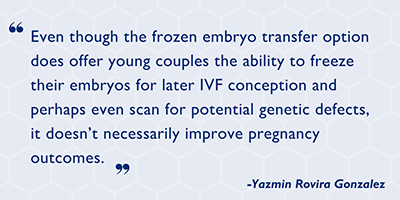 Even though the frozen embryo transfer option does offer young couples the ability to freeze their embryos for later IVF conception and perhaps even scan for potential genetic defects, it doesn’t necessarily improve pregnancy outcomes. The findings of this study provide valuable information for ovulatory women who suffer from infertility and are interested in undergoing IVF but are struggling to decide between embryo transfer choices. Fresh or frozen, either way appears to work. A medical student breaks down a slew of numbers quantifying human reproduction in The Life Lottery. At Johns Hopkins’ Center for Fetal Therapy, specialists are pushing the boundaries of prenatal treatments to give mothers and their at-risk unborn babies the best shot at life. Read more.